Once upon a time I promised to show you each room in our cottage after I had finished decorating it. It's been a slow process because not only are we decorating our newly built cottage, we're also sculpting and decorating our landscape. We were fortunate to have good weather all through October, so I spent most of the month outdoors. However, I did find some time to finish my craft room. Come in and I'll show you around. The room is small -- about 9 x 10 -- and I have a lot of supplies, so I had to come up with creative solutions for storage while allowing for floor space to pursue my indoor creative endeavors. 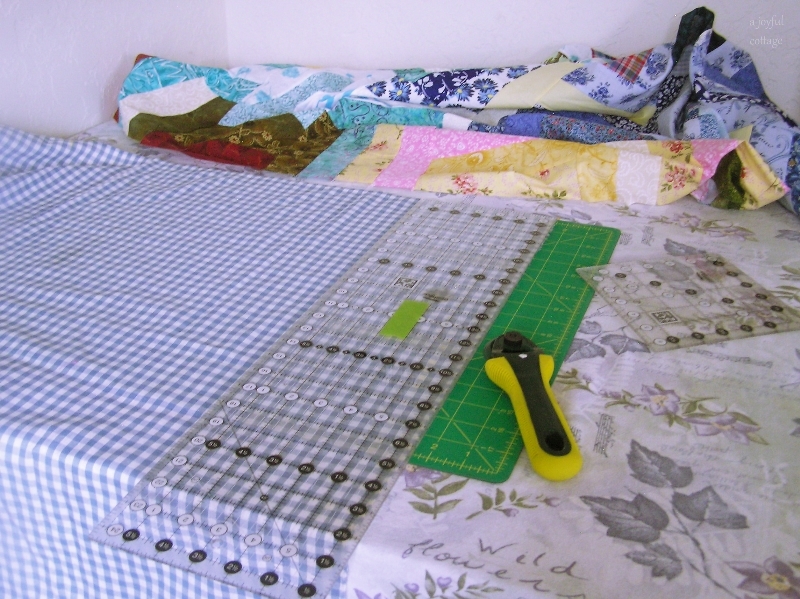 (I write, sew, quilt, decoupage, repurpose/restyle and plan to try even more crafts in the days ahead). I wanted my room to be pretty as well as functional, and it all had to be done on a low budget. Like pretty much $0. Some people shop their homes. . .I shopped our rented storage shed. To our left, as we enter, is the nerve center of my creative life. 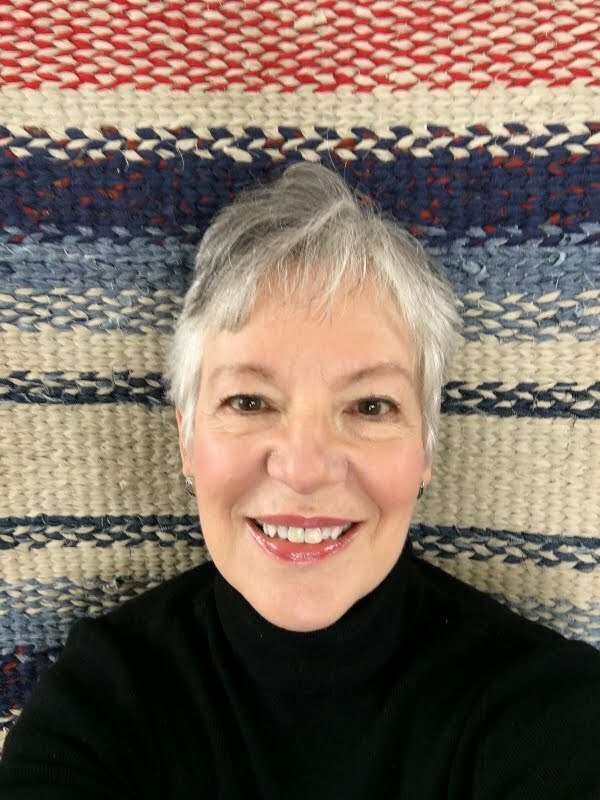 I write and blog here, search for homes to feature in my Living Large In Small Spaces series, and plan my next creative move. My desk is "new". A combination of three pieces that I repurposed and restyled into one. Remember this from my "Projects Galore!" post? Not only fun to create, it was super inexpensive to do. I decoupaged my $5 file cabinet with graphics I downloaded from The Graphics Fairy (is Karen not the most generous person ever?). The desk top is an old cupboard door and the "leg" is made from scrap lumber. (You can't see it in the after photo, but the leg is painted a pale pink.) 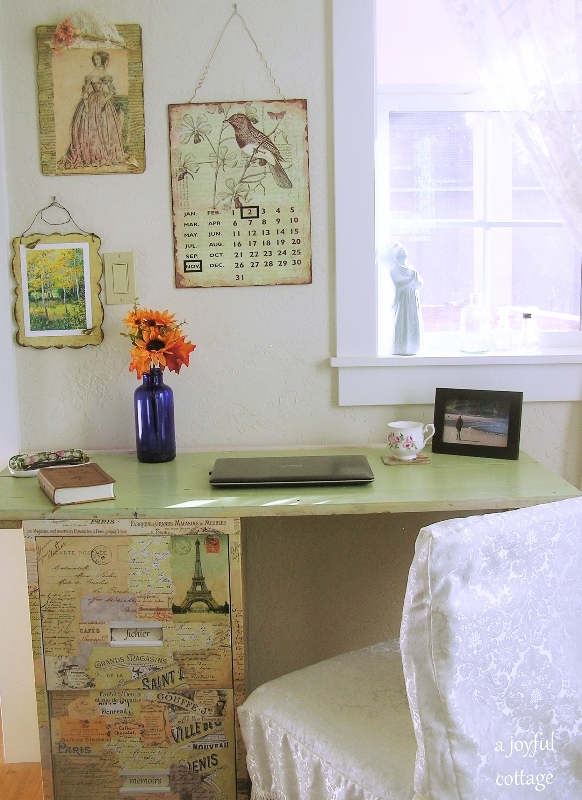 The desk is shabby and fun, custom sized for the available space, and I love it. 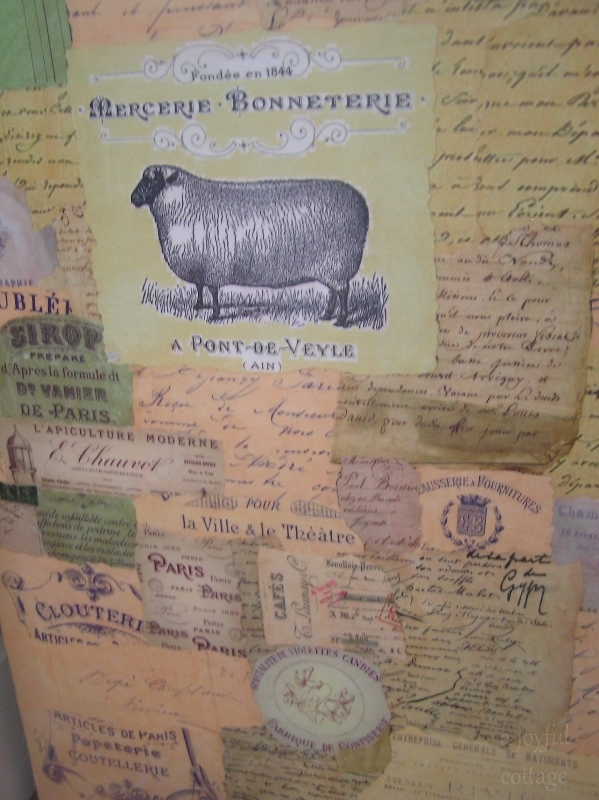 The ephemera is wonderful, and I'm especially fond of the outer left side of the desk with the sheep sign. It's a French sewing and notions store graphic Karen created. I thought it perfect for my room. 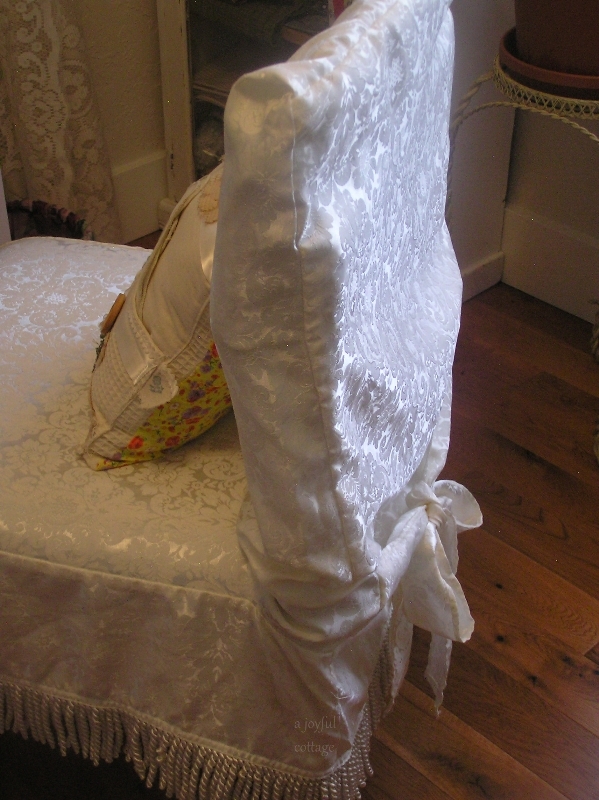 The chair's white slipcover was a recent $1 find at the Habitat thrift store. 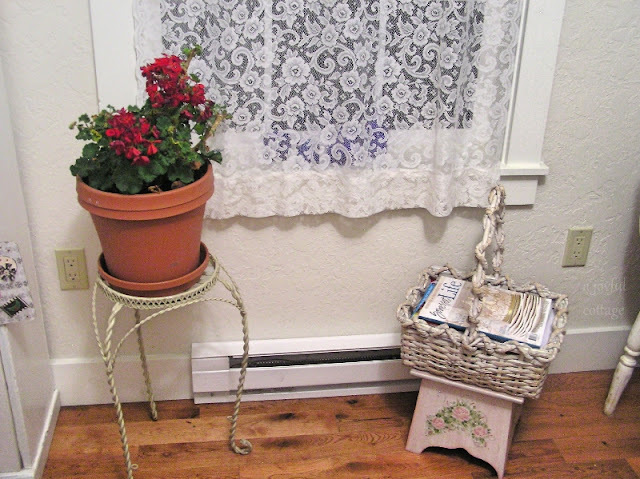 This lace curtain was in a pile of window treatments at a yard sale. They were all in great shape -- some lace, some voile. I paid $10 for the bunch, and I think that works out to something like 75 cents a window. The tie back is a hanky I bought a couple of years ago at a gift store in Hood River, Oregon. Another $1 find. 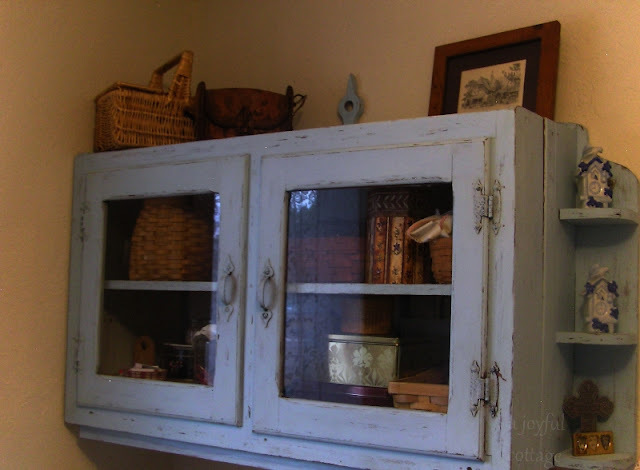 If you've followed A Joyful Cottage for awhile, you may remember this vintage cupboard. I used it for books in my last craft room. Now it holds my fabric. This little sign made by my friend Robyn hangs on the cupboard door knob. The quote "A small house will hold as much happiness as a big one" is so true. Another lace curtain hangs on the south window. I brought the geranium indoors for the winter. The plant stand and little hand-painted pink stool were second-hand finds, $1 each. 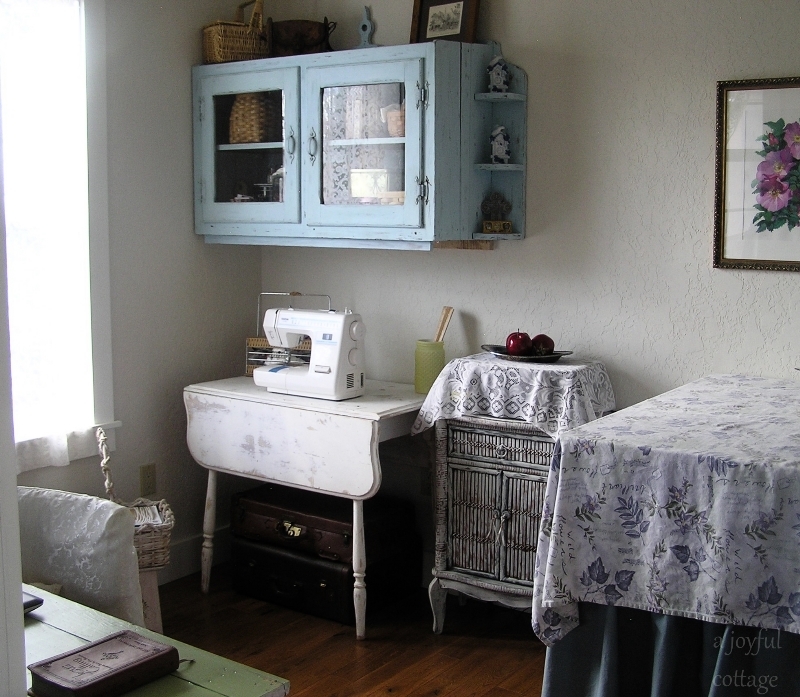 The vintage drop leaf table came out of storage for use as a sewing table. I like the flexible size of this table. . .perfect for my small room. Vintage suitcases under the table hold quilting and office supplies. 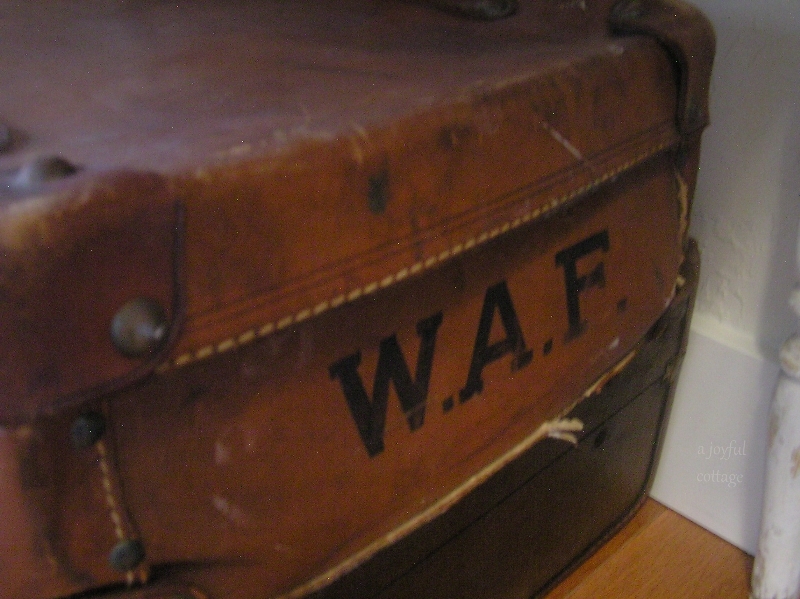 I'm really crazy about the top suitcase, which belonged to a WAF. Above the table is a wall cupboard restyled from a handcrafted funky something-or-other we found at a thrift store last year for $20. Here's a before picture collage of the handcrafted Funky Something-or Other. This was a big project for the craft room. Dennis sawed off the legs and shored up the cupboard for hanging. 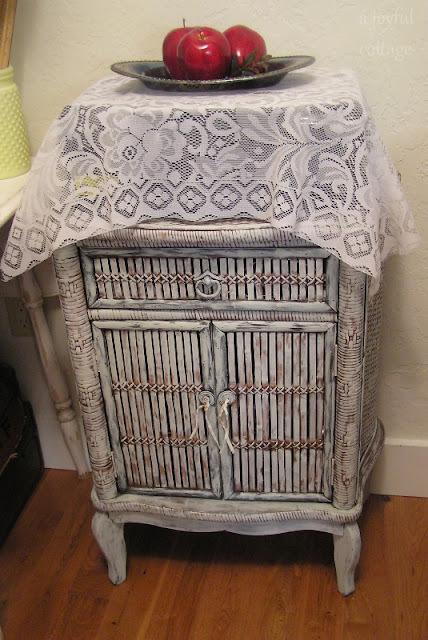 I gave it 2 coats of homemade chalk paint (which is a whole other post for another day) and did a little distressing to give it a worn look. Then Dennis sawed off the little shelves on the left and we hung the cupboard on the wall. The remaining shelves hold a few family mementos. Interior cupboard shelves hold all manner of craft supplies in various containers. My $15 bombay chest (another yard sale find a year ago) received a makeover, too. My printer sits on top. It's covered with lace when not in use because I like looking at white lace more than I like looking at a clunky black printer. I store my steam iron and other odds and ends inside the chest. Another piece from my "Projects Galore!" post. I repurposed our counter-height table for a craft table and made a skirt to hide storage boxes underneath. 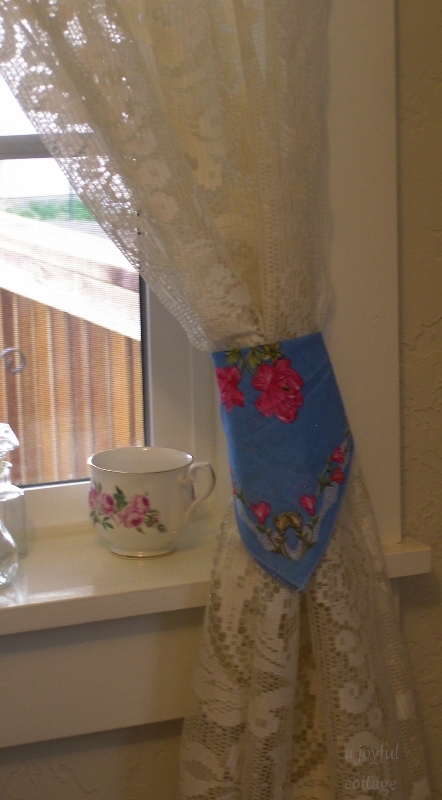 The blue fabric cost 50 cents, the floral table cloth was $1. Both thrift store finds. The tall height makes it a very ergonomic cutting table. I hung two very different pieces of art. The wild roses watercolor was painted by my husband. The shabby chic metal wall art came from Graham & Brown. I inserted the printed scrapbook paper for a back to nature look. 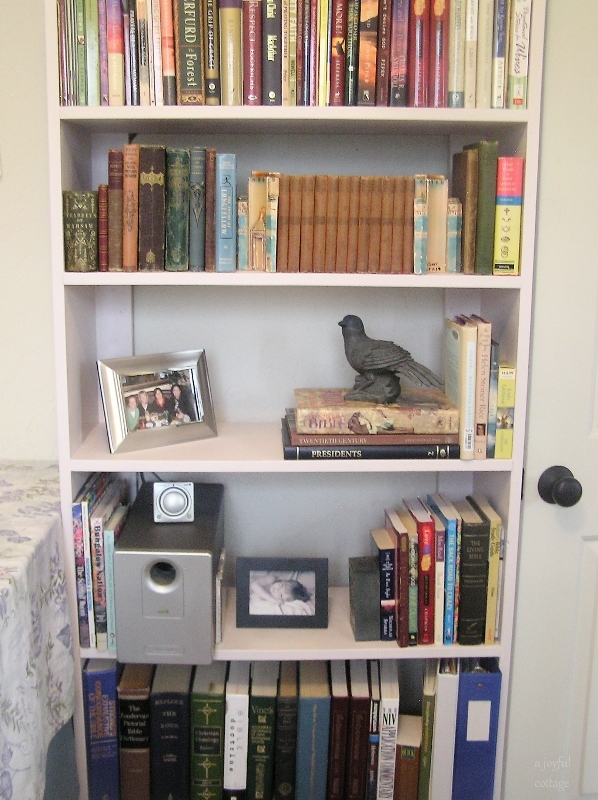 The bookcase once served as utility shelves. I cleaned it up and painted it a very pale pink. It fits perfectly between the craft table and the door, and holds all my books and CD player. This pretty room reflects my personal style, and has everything I need for hours of creativity. I smile in anticipation of what I'll discover every time I walk through its door. Thanks for taking my cottage craft room tour. It's always fun when you come to visit. 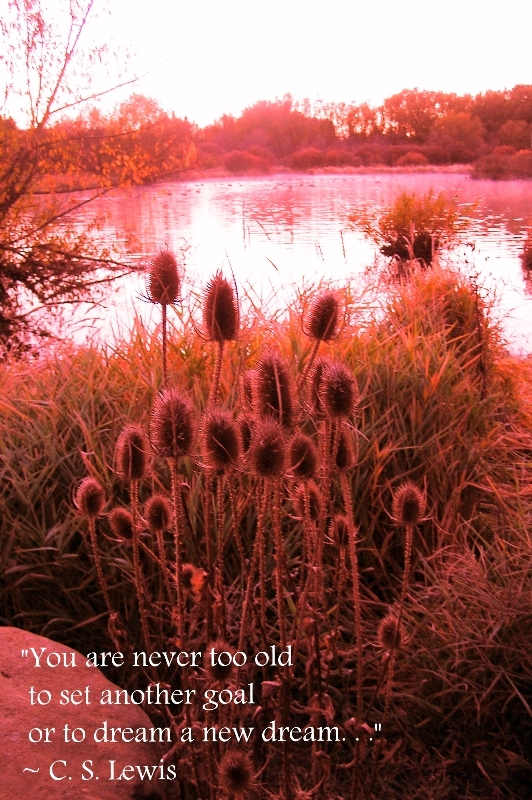 This photo was taken by me at a nearby pond last fall. I was looking forward to seeing your craft room finished. Lovely and everything is right there. Congratulations. Wow, very impressive. It's always fun to see where a fellow blogger works from. Your desk is perfect and with a peek-a-boo view, too. The quote about happiness is so true. Your craft room looks terrific and so many wonderful storage places. Mine is in the garage and I don't go there anymore, because it is one hot mess. Maybe after seeing what you have done I will get on the ball and do something. Looks cute as well as functional. I'm still working on getting my together and it's a slow process.. You created a creative space on a very low budget! The room looks fabulous and welcoming. My sewing room is about the same size and is definitely NOT as tidy or welcoming. I love what you did. So many great ideas for storage. I'm so happy for you having a new studio, just for you! It's the best thing ever to have a space where every single inch holds special things that speak to you and make you happy. Yay! Aw, thanks for joining in my joy, Laurel! This room sounds like it fits all your interests perfectly. I love all the thrifting you did including shopping in your storage shed. Waste not, want not. The perfect studio. Thanks for the tour. Your room looks so organized! 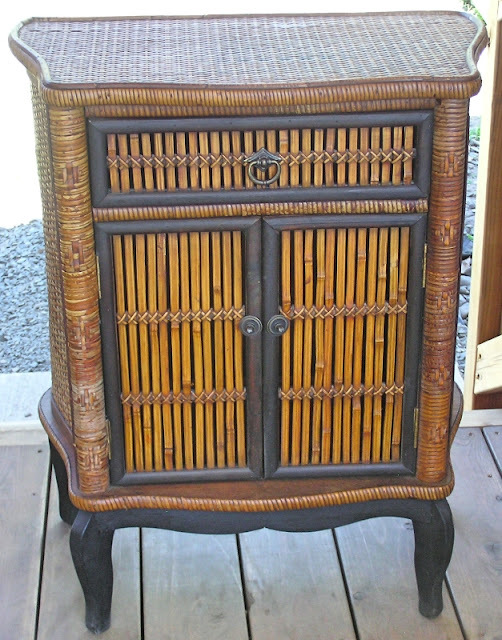 I love your funky old wall cabinet! You did a fabulous job painting and distressing it. I thought for sure it was the original old paint! 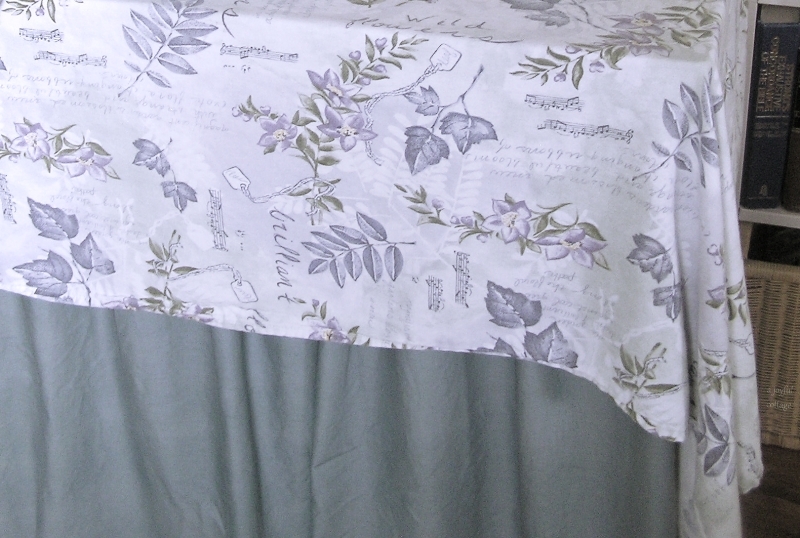 I use a drop leaf table as my sewing table, too. Works great! Thanks for the tour of your studio, Nancy. I love your creative space. It looks so cozy and fun in there. You are very organized with all your stuff. I love that drop leaf table for your sewing area. Sooooo sweet. This post is inspiring for me! I have a small room at the top of the house. It is about 5X10. I have furnished it with bits and pieces but was feeling discouraged. I can see, from your room, some solutions for storage challenges, and the piece of lace over the printer is the first I'll use......over my Cricut machine! Nancy you are living that wonderful quote! 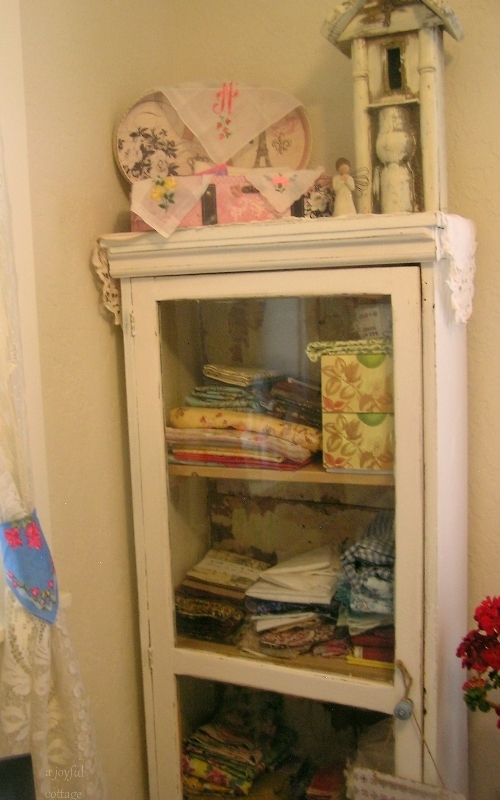 Your craft room is enchanting and filled with repurposed pieces that have been sweetly reloved. I am curious your source of lighting, I didn't spot any task lighting on the tables, is it all overhead? Love the cupboard I feel seeing fabrics and textures displayed sparks the imagination for future projects and is satisfying - like eye candy. I admire your photography and your last photo is a captivating capture. Thank you for the tour. Such a lovely room Nancy with so many creative touches. It seems fitting that almost everything in your craft room was something that you recreated and repurposed. Love the blue cabinet, what a great solution for storage in a small room. Thanks for the tour! Absolutely charming, Nancy! That blue painted wall cabinet is SUCH a great addition and find, and the color blue is striking. My studio here is only about 8X11 and it suits me just fine for my reading and writing room. I see SMALL spaces as not a problem or inconvenience, but a fun challenge to see how we can make them functional and especially BEAUTIFUL as you have done. Have a super day! I 'love' your craft room. You've done so much with spending little $ and that's my style. It all looks pretty. The painting by your husband is really lovely. I really like that blue cabinet you repurposed and hung on the wall. It's fantastic. I know you are going to enjoy spending many yours in this space. It's neat to see where you write your posts too. Thanks so much, Deb. I'm pretty happy withe the file cabinet makeover. 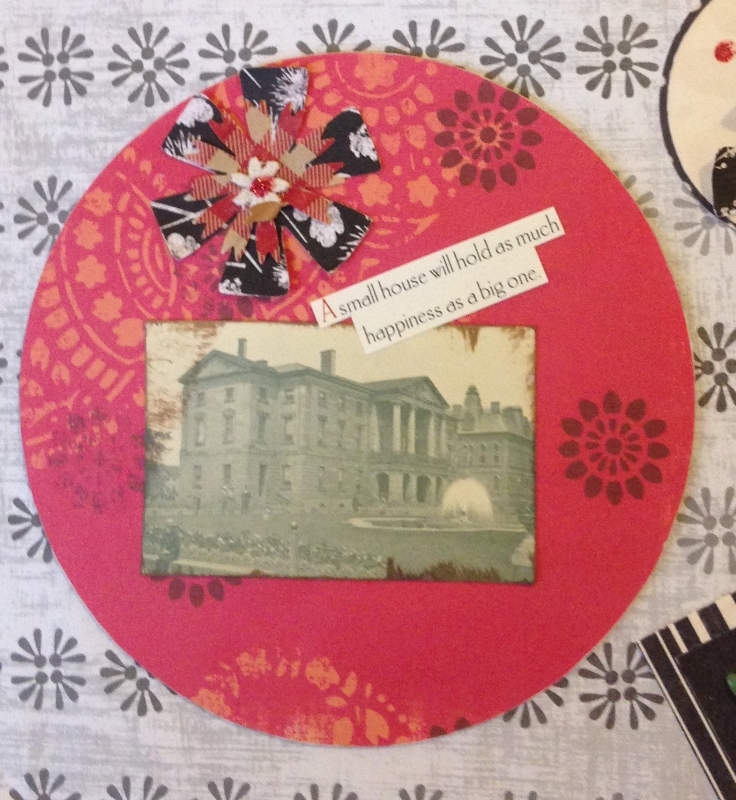 You gotta love Mod Podge! Everything tucked in, tidied up perfectly, creatively . . . just for Nancy . . .
i could be very happy tucked away in your little craft room. Nancy! You did an awesome job of creating a wonderful space to be creative ! I love the wee cupboards and tables and the way you found a place for everything! I am sending away our permit to the county for approval on the guesthouse....so as doors open we will go through them I guess!! I may have a cottage to share with you one of these months!!! Thanks for your inspiration ! How exciting, Dawna! I can't wait to see your dream come true. Thanks for the nice compliments. This room was a fun project in every respect. I've been waiting to see your craft room and I'm not disappointed with one teeny, tiny thing you've done there! Once again you've inspired me to make my creative space match the dream for it. I love the way you've repurposed and found things on the 'cheap'. My kind of shopping! I can imagine you spending many long hours in this sweet room through the long winter months. 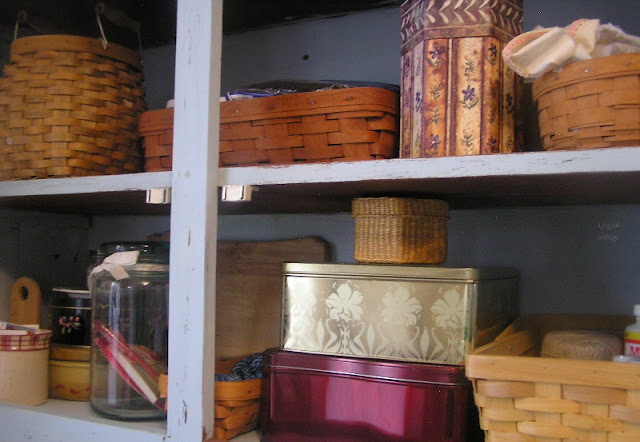 I'm working to clean, organize and 'spiff' mine up for winter day projects. I'll share it sometime soon when it's back in shape again. I have to downsize a lot of bins and boxes of things left over from days when I had a custom sewing business in a room built into our garage. Letting go of things I love is hard but, in the end, I know I'll love my 'new' smaller room more than I can imagine. Thank you for sharing and for inspiring me. Again! You've done a Fabulous job! 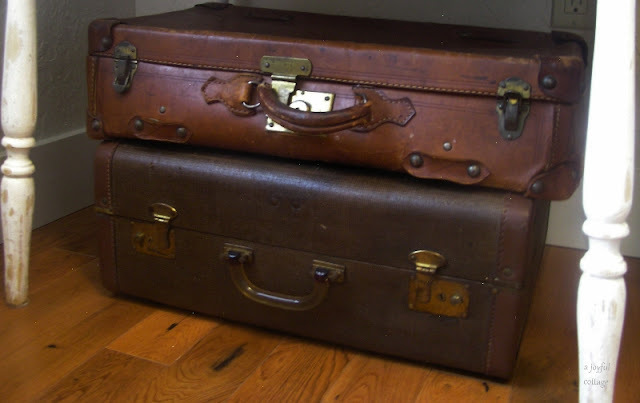 Each piece is perfect and beautiful; I especially like the old suit cases. You must feel wonderful having finished another room! It is so perfectly you with all your special things and some new things all around you. I love the desk with the graphics. The picture at the end is just gorgeous. Looks like a creative outlet you should pursue!! Beautiful. I love the file cabinets. An abundance of great finds 'remade' with much love! Nancy, what a wonderful space you have created! Love the blue cupboard with the little shelves on the side. 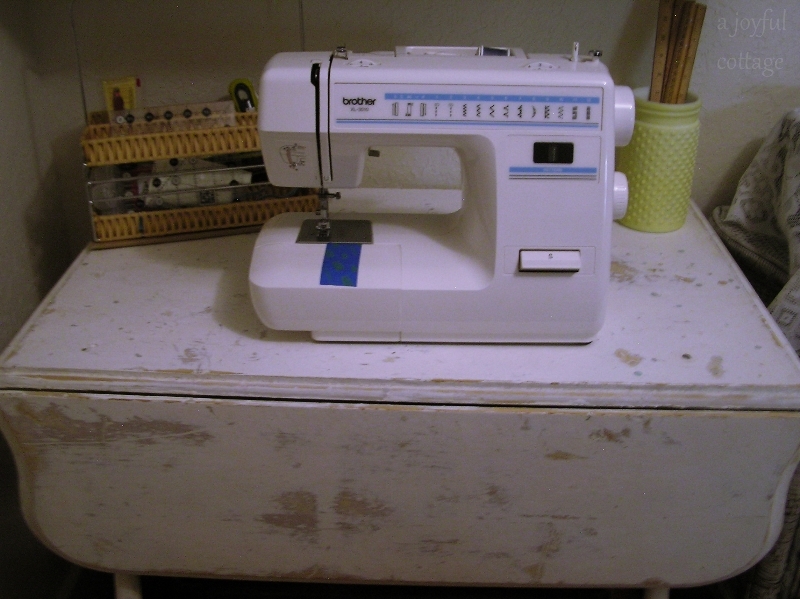 I use a drop leaf table for my sewing machine as well. Your suitcases are wonderful and great for extra storage. The table you made with the filing cabinet is awesome and I love the graphics! Thanks for sharing with SYC. Your craft room is wonderful! Thanks for the tour! I especially like your decoupaged filing cabinets (what a great idea!) and the cupboard you hung on the wall! Did you use special anchors to hang it? You really have created a sweet little haven in which to be creative. Lovely! Hi Anne. Dennis screwed an anchoring horizontal board into the studs. Then he screwed the cupboard onto the board. He also screwed a second narrower board under the cupboard for the cupboard to "rest" on and give it additional stability. It is well attached and sturdy now. I've seen photos of your studio on your blog and I love it! You have done a great job with your creative space - functional but pretty too! 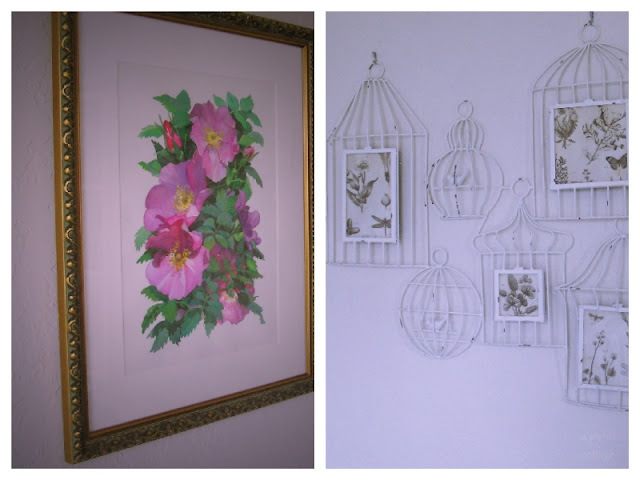 :-) Your husbands watercolor is a marvelous addition! You have a lovely craftroom and the fact that nearly all items are thrifted makes it all the more interesting. Oh, my goodness ! I love the suitcases and the entire space actually. 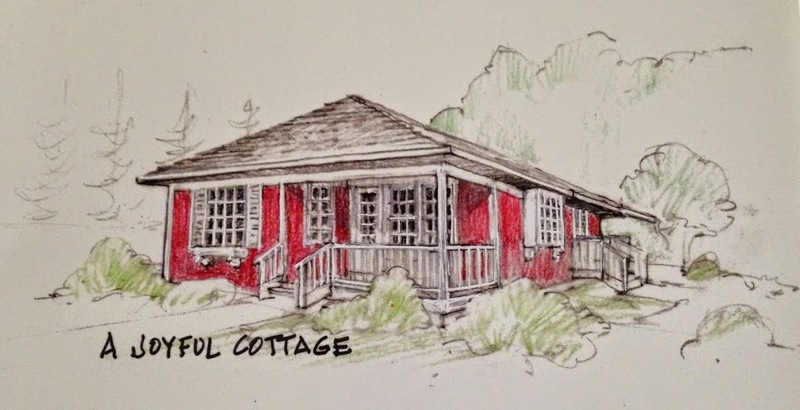 I have not forgotten about showing my little cottage on your blog. I have been waiting to finish our kitchen. The final repairs will be made this coming week and the painter will be here the following week. Then I can write about our little cottage and how we have made it the functional. The reason for the delay is that we had to recover from having our daughter take over the guest room for a few months.